A chuppah is a canopy, traditionally used in Jewish weddings. It consists of a cloth or sheet supported by four poles, and it symbolizes the new home that the couple will build together. It is open on all four sides to invite the community to share in the joy of the wedding. In Hebrew, chuppah means, "that which covers or floats." There are 2 kinds of chuppah kits available on this web site. 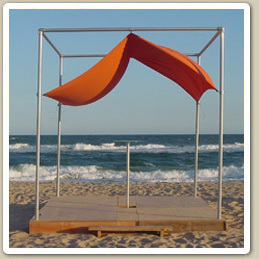 Both chuppah kits take the traditional form of the chuppah and give it a modern interpretation.The Artisan Chuppah kits are free standing metal frames with floating canopies made out of a fabric of your choice. Expect more from your chuppah.